A new radio documentary investigating the murder of Henry Phelan, who was the first member of the garda siochana to be killed, will be aired on Tipp FM this weekend and next.Phelan, who was from Mountrath, was killed in Mullinahone in 1922, but he was in fact stationed in Callan at the time, and previous to this had served in Kilkenny City. County Kilkenny features heavily in the documentary, including coverage of the incident at the time by the Kilkenny People. 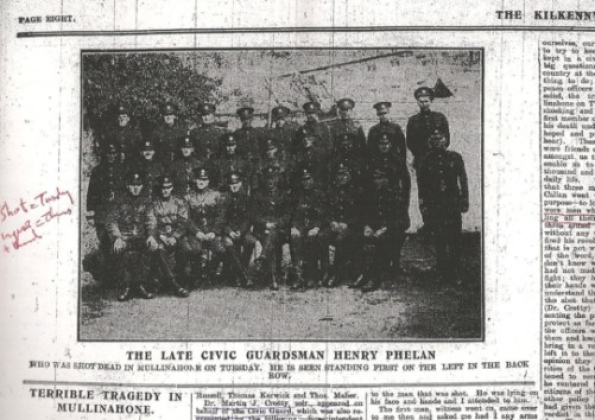 On the afternoon of November 14, 1922, Henry Phelan became the first member of the new Civic Guard (later renamed An Garda Síochána) to be killed when he was shot in a quiet pub in Mullianahone, County Tipperary. He was on a simple errand to get a hurling ball for a team he was starting where he was stationed in Callan. He was 21 years of age at the time, but the circumstances behind his killing and the identities of those involved have never been clear. Today, almost 90 years later very little is actually known about young Phelan’s own background. A new documentary due to be aired next weekend has looked into the man’s life both before and after he joined the force, and also examines some of the theories concerning why he may have been targeted. The original Civic Guard application form that Henry Phelan filled out in his own hand writing together with the required letters of recommendation from his local parish priest and his IRA commandant are also featured in the documentary. Phelan’s first posting was in Kilkenny City, and after a short time he was transferred to Callan in South Kilkenny. On the day he died, he had travelled with two colleagues to the village of Mullinahone. After purchasing the sliotar the three men entered the public house of Mrs Bridget Mullally when according to reports three men walked in. One produced a revolver killing Phelan instantly. No one was ever charged, and over the years it was thought he had been mistaken for his brother who had served in the RIC in Co Tipperary. Another theory is he was mistaken for a former RIC man from Kilkenny who had the same name as one of his brothers. The documentary also includes a visit to the pub where the shooting occurred and will reveal possible clues and suspicions regarding the identity of his killers. The two-part documentary, entitled “A Boy of Good Character: The Story of Garda Henry Phelan” was produced, presented and researched by Tipp Today producer Tom Hurley and was made with the support of the Broadcasting Authority of Ireland and Tipp FM. Part one is due to be aired on Tipp FM radio on Sunday,t May 20 at 6.30pm, with part two the following week.